We were contacted by an athlete who is looking to transition from biking/running into triathlon. He wanted to know if we had any tips for new swimmers. Practice floating. It sounds basic, but floating is one of the toughest skills for swimmers to master and improving body position is one of the easiest ways to cut drag. Before you begin your workout, spend 10 minutes working on your body position. Can you get into a streamline position and float at the surface of the water without kicking? Do your legs sink or does your back arch? Does your body get out of alignment when you breathe? Can you float on your stomach and your back? If your legs begin sinking, try to press on your chest to get them back to the surface. Practice feeling what happens to your body when you change your head position. Keep your elbows high during the pull. When we were new, our coaches would remind us to imagine that we were “scooping a barrel” during our underwater pull to help us keep our elbows high. When your hand enters the water, think about your “swimmer’s hand,” which means pulling with your fingertips, wrist, forearm, and then elbow. You can really focus on your underwater pull by isolating your arms. Put fins on and swim right arm only for a 25 and then left arm only for a 25. You want each side to feel balanced. Practice drills like Fists Drill, which force you to feel the water with your forearms during the pull. 90% of Freestyle is spent on your side. When swimming Freestyle, remember to rotate slightly from side to side when taking each stroke. When your hand enters the water, extend it as far out as you can go before you start to take your pull. Sometimes swimmers start the pull as soon as their hand enters, and you miss out on the extension and glide part of the stroke. Reaching forward will lengthen your stroke and will help keep your stroke smooth and allow you to conserve energy. From time to time, try adding a freestyle snorkel into your swim training to practice having long, even strokes. The snorkel allows you to swim without focusing on the breathing which will allow you to concentrate solely on your pull and rotation. Practice bilateral breathing, even if you’re brand new. Bilateral breathing is an important training tool to help even out your stoke. All swimmers, from beginners to advanced levels need to practice bilateral breathing. We all have a dominant side, but if we only breathe to that side, our strokes will become lopsided, and therefore less efficient. Try breathing every three strokes and see how that feels. As you get more efficient, you can increase to breathing every five strokes, etc. Swim long. This can be difficult, since the normal tendency is for a swimmer who’s tired to start shortening their strokes and increasing their turnover. When this happens, the swimmer’s hips sink, and they start to plow through the water and use much more energy, rather than gliding on top of the surface. Remember to maintain your stroke length. If you can maintain your stroke length even you’re tired, you will start to notice that you can swim for longer and longer periods of time with good technique. Practice drills like distance per stroke and challenge yourself to maintain a certain number of strokes during every lap. As you progress, you can start playing games like GOLF, which will allow you to think about your stroke rate at different speeds and how it relates to your times. In the above photo, you can see that Katie extends her pulling hand ahead of her after it enters the water, which allows her to reach a few inches further than she’d be able to if she weren’t on her side. Her shoulder is dry during the breath and even her hips have rotated. Hi Chris, thanks for sharing! Thanks for sharing this post, Tracy! This is on my Bookmarks bar. 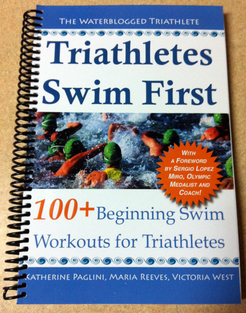 Reviewing “Triathletes Swim First” on Amazon is way past due and I am embarrassed to admit I haven’t put pixels to plasma on that yet!